This caught us ALL off guard. Actually my wife got an email forwarded to her from a friend. And then I got one from a friend at work. Why didn't we hear about this in the media I thought? A little more research told me that it was "Air Force Week" and we would be treated to a flyby of vintage military aircraft. They were supposed to fly over Griffith park and on to Hollywood and Highland where there was a ceremony celebrating "Air Force Week". I went out on a limb and left work to drive to Hollywood. I actually found a prime spot on top of the upper parking lot at Home Depot near Sunset & Western. I waited and waited. Then, here they came. One by one, flying East to West right above Hollywood Blvd. The F-22 Raptor leading the way. 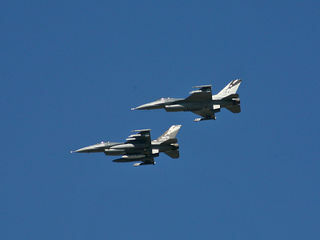 Followed by 2 F-16 Fighting Falcons. 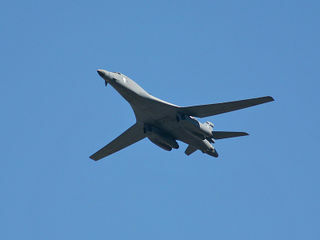 Then the B-1 Lancer Bomber followed by the famous B-52 Stratofortress. And then a real treat. 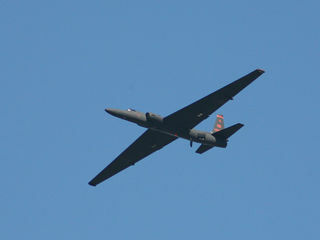 The once secret U-2 "Dragon Lady" Spy Plane. I had read that a C-17 Globemaster was supposed to fly by also but I never saw it. DAZZLING MILITARY AIRCRAFT FLYOVERS: Media will see and hear Hollywood's first spectacular, breathtaking flyover of aircraft like U-2 Dragon Lady surveillance plane made historic when its pilot, Francis Gary Powers, survived being shot down while over the Soviet Union in 1960 and eventually came to Los Angeles as a TV news helicopter pilot; and also a single engine, multi-role F-16 Fighting Falcon, equally capable of handling combat against enemy aircraft and striking enemy targets with devastating accuracy. 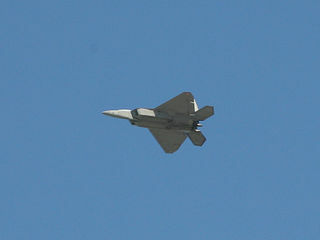 Other flyovers are the B-1 Lancer supersonic bomber, the only variable-sweep wing aircraft in the U.S. military inventory, and the F-22 Raptor, the Air Force's incredible stealth fighter unmatched by any known or projected fighter aircraft. Other aircraft participating in the flyover are the world's most versatile airlift aircraft, the C-17 Globemaster III, with a maximum payload of 170,900 pounds. The C-17 airlifts injured personnel, provides humanitarian assistance around the world in the aftermath of natural disasters and even brought Keiko the killer whale, star of "Free Willy," back to his home in Iceland. 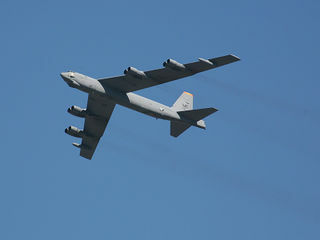 Additionally, you will see the legendary B-52 Stratofortress, which has the longest unrefueled range of any contemporary bomber.